It’s here! We are excited to share with you the first newsletter of the school year, created by the Midland Institute, with you in mind. Look below to read stories and inspiration from our CEO Network for a behind-the-scenes look at what you’ve helped accomplish by being a part of the extended CEO Family. Thank you for reading! You share roots with individuals you’ve never met. Did you know that your CEO family extends outside the boundaries of your own community? When you become a CEO student, facilitator, investor and/ or mentor, by default, you become part of our CEO network. Like any family, the branches on our family tree grow in all directions: east, west, north and south. This means that you share roots with individuals you’ve never met. These are individuals who boast a broad range of talents, knowledge and resources, who are looking to connect with people like you! As we’re sure you’ve heard, to foster this network, Midland Institute has launched a social media platform: CEO Connect. Our hope is that you utilize this networking tool to meet new people with whom you share common ground. Take a look at http://midlandceoconnect.com to reach out and connect with your extended CEO family today! CEO brings life to Communities. Entrepreneurship is relevant in every sphere, which makes CEO an investment for any community. 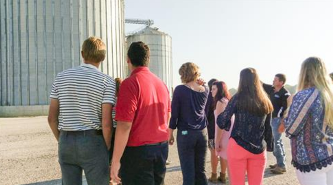 Read how CEO students in Crawford County connect entrepreneurship with agriculture, specifically, and see how CEO is enriching its students as well as its communities. CEO alumnus, Zachary Mette, is a hard-working, young man with a very bright future. Though he is just nineteen years old, it is clear that the entrepreneur (and soon-to-be graduate of Kaskaskia College) has the ‘keys’ to success firmly in his grasp... And he knows just how to use them. With an entrepreneurial family history, the 2014-2015 Effingham County CEO graduate took well to the CEO program and its various challenges. He approached each task with vision, enthusiasm and a work ethic that he undoubtedly developed while working part-time at Mette’s Cabinet Corner, his family’s local business. But when it came time to decide on a personal business, the Teutopolis native, was at a loss. In fact, Zachary’s entrepreneurial epiphany gave a whole new meaning to the phrase, “lightbulb moment.” Stemming from his family’s own desire for custom lighting with local service, Zachary crafted a business model that catered to the needs of an entire community… his family included. Indeed, word of mouth has been a powerful marketing tool for the young entrepreneur. Already, Zachary has outfitted entire homes in his customized lighting. He was also the first, in Effingham County, to install LED tape lights under kitchen countertops. On October 31, 2016, the Effingham County CEO graduate officially unlocked the doors to his first professional showroom for Mette’s Distinctive Lighting. The showroom is located at 1901 S. 4th Street, Suite 11 in Effingham, Illinois. If you’d like to learn more about Zachary and his story, or view the store’s products or services, please visit http://mettesdistinctivelighting.com/About.asp. Lift up your head, explore, and be amazed. Life is busy. Whether it’s a project at work, a new school year, or combination of other life challenges, sometimes it’s hard to slow down and make sense of it all. Craig reminds us that even in that busyness, if you just lift up your head, you’ll see that you’re surrounded by countless exciting people and opportunities. Go ahead, lift up your head, explore, and be amazed. Interested in hearing more life lessons from Craig?